The measure, the Coastal Texas Protection Act, is directed at advancing the construction of a long-awaited “Ike Dike” or Coastal Spine – proposed after Hurricane Ike in 2008 – to better protect the Gulf Coast from storm damage. In 2016, Cornyn advanced legislation signed by then President Barack Obama to streamline the Army Corps engineering studies. According to a Cornyn aide, the 2016 bill prevented the Corps from duplicating efforts by requiring them to take into account studies that had already been conducted by the Gulf Coast Community Protection and Recovery District (GCCPRD). The new bill would direct the Corps to expedite the completion of the Coastal Texas Study. It also provides a necessary exception for the project under the Coastal Barrier Resources Act (CBRA). Currently, the CBRA restricts the expenditure of federal funds associated with coastal barriers to avoid encouraging development of such barriers. Kudos to Cornyn, who is capable of getting stuff done when he wants to. Of course, introducing a bill is not the same as passing it, and the Republican Congress has a crappy track record by any measure. You have to start somewhere, and this is it. Check again in a couple months and see if it’s gone anywhere. How about we excavate those reservoirs? The U.S. Army Corps of Engineers is quietly exploring the possibility of excavating dirt from Addicks and Barker reservoirs, reviving an oft-discussed proposal that would allow the reservoirs to hold more storm water and keep it out of nearby Houston neighborhoods. Depending on the scope of the project, removing silt and dirt could increase the reservoirs’ capacity significantly, perhaps even doubling it, by one Corps official’s rough estimate. Whether the agency moves forward could depend in part on whether it can find someone to take all the dirt. The idea of excavating the reservoirs has been a fixture of official reports and politicians’ to-do lists for more than 20 years. Thanks to Harvey, its time may finally have arrived. In a notice posted on the Internet, the Army Corps said it “is evaluating the level of interest from government, industry, and others parties for the excavation and removal of alluvial soils deposited within” the reservoirs. “The concept of the potential project is to allow for the beneficial use of material by interested parties while increasing capacity” at Addicks and Barker, the notice said. It appeared Jan. 24, with no public announcement, on a website that advertises business opportunities with the federal government. Corps officials won’t say anything further about their plans, including how much soil would be excavated, how much it would cost or who would pay. Read on to learn more about the dirt, which is actually kind of interesting. The question of how much this would cost and who would pay for it seems to me to be the more fundamental issue. A third reservoir is still a good idea, but increasing the capacity of the existing reservoirs would be wise as well. Probably cheaper, and faster to accomplish, too. I doubt anyone is opposed to this, so what do we need to do to get this started? Houston City Council on Wednesday approved funding nearly 60 home buyouts across three flood-prone neighborhoods, the first such step from City Hall in recent memory. The city typically leaves buyouts to the Harris County Flood Control District and, in fact, the measure approved by the council would send $10.7 million to the district to pay for the purchases, estimated at about $175,000 per property. Houston has not had any in-house staff devoted to the issue in recent memory, but Hurricane Harvey has spurred city officials to acknowledge the need to remove more flood-prone residences from harm’s way, leading to Wednesday’s vote to fund voluntary buyouts in three working-class neighborhoods. 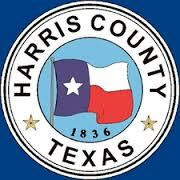 Harris County Commissioners Court approved the deal earlier this month. Mayor Sylvester Turner said he “absolutely” expects the city to fund additional buyouts in the months to come but that the strategy must be paired with channel improvements, new reservoirs or detention basins and other flood mitigation efforts. In fact, Harris County Judge Ed Emmett on Wednesday unveiled 15 recommendations to combat flooding on a regional basis, calling for, among other things, more buyouts, cooperation across city and county lines, an expansion of county floodplains, and the immediate funding needed to complete several flood control projects along area waterways. The dollars approved by the council Wednesday are federal funds the city received after two floods in 2015, and are earmarked for areas that suffered in those storms, Turner said. City data show each area also suffered significant damage during Harvey. As Mayor Turner says, this is one piece of a very large puzzle. Among other things, you want to avoid creating a smattering of abandoned properties in the middle of neighborhoods. Locations for buyouts are going to have to be chosen very carefully. Creating a regional flood control organization that can coordinate water management across county lines. Releases from Lake Conroe in Montgomery County have been fiercely criticized by Harris County residents. Increasing regulations on development in flood prone areas, including rethinking floodplains. The county is currently conducting a reevaluation. Developing an improved flood control system and localized evacuation plan that could utilize volunteer organizations to help first responders, as well as how to coordinate high-water vehicles and private boats. Residents in the areas around Addicks and Barker dams have called for a better warning system, and the U.S. Army Corps of Engineers, which operates the dams, considered such a system before dropping the idea two decades ago. Installing automatic barriers at flood-prone underpasses and developing a plan for closing such underpasses. After the Tax Day floods, Emmett said he would lead such an effort. Buying out all homes located in the 100-year floodplain or that have flooded repeatedly. The County has several disparate buyout efforts ongoing, but a larger scale program will probably cost billions of dollars. 9. Expanding the role of municipal utility districts. If your local MUD isn’t doing much about preventing flooding, Emmett thinks that needs to change, that their responsibilities should include both storm water management and flood control in cooperation with the flood control district. 15. Giving Harris County ordinance-making power. Even though if unincorporated Harris County were a city it would be the fifth-largest in the country, Harris County doesn’t have ordinance-making power. Also, Emmett said county government should receive some of the collected sales tax rather than just relying on property tax. “To continue to exclusively rely on the property tax is fundamentally unfair and unsustainable,” he said. This is much more of a long-term shift, however, Emmett said. The governance of MUDs is definitely an issue, but I think this is the wrong approach. Especially since we need to get a handle on the kind of build-everywhere growth that MUDs promote, I say we should at the least encourage, if not outright coerce, existing and proposed MUDs to incorporate or be annexed. MUDs may have served a purpose in the past, but it’s a model we should not seek to perpetuate. It’s time for a different approach. Space City Weather has more. What should the people living near the dams have known? More than they were told, is what they’re saying. A federal lawsuit against the U.S. Army Corps of Engineers claims government officials knew for years that water impounded behind Addicks and Barker dams would flood thousands of suburban homes during an extreme storm – and yet did nothing to advise or compensate property owners. The lawsuit was filed on behalf of Christina Micu, a homeowner in the Canyon Gate neighborhood in Cinco Ranch, a subdivision that essentially became part of the Barker Reservoir during Harvey. The case is pending in the Washington D.C.-based U.S. Court of Federal Claims. Canyon Gate was inundated for more than a week when the Army Corps allowed water impounded behind the dams, called the “flood pool,” to reach record size as more than 50 inches of rain fell between August 25 and 29th. More than 30,000 people own property and more than 140,000 people live in areas that Harris and Fort Bend county officials have identified as subject to inundation from those flood pools, according to a Chronicle analysis of evacuation orders issued during Harvey. There’s already one lawsuit over the issue of compensation for the damages caused by the dam releases – basically, that’s a takings claim, like when eminent domain is used. This one has that element and more in it, and there’s still more where those came from. In the weeks since the storm, a slate of high-powered law firms have coordinated to recruit as many as 10,000 plaintiffs in Houston. Other lawyers — particularly those who specialize in eminent domain and environmental law — are operating independently. Most of them are pursuing cases for downstream residents like Pledger who live along Buffalo Bayou and were impacted by the Army Corps’ controlled releases. On a recent weeknight, Pledger and dozens of other flood victims packed into a private meeting room at a local Mexican food restaurant to consider a pitch from yet another legal firm over complimentary fajitas. Other than flooding during Harvey — most for the first time — the residents all had one thing in common: They live downstream of two federally owned reservoirs that got so full during the unrelenting rainstorm that the U.S. Army Corps of Engineers had to release an unprecedented amount of accumulated water into a bayou that snakes through their neighborhoods. All told, lawyers and legal experts say the spate of lawsuits may become one of the largest inverse condemnation-related legal challenges in U.S. history, driven in part by the high value of the impacted homes, which are all on Houston’s wealthier west side. But they are mixed in their forecasts of how the cases might play out. Many say the property owners have little chance of winning, citing a variety of state and federal legal opinions; others say property owners have a fighting chance, although many admit it’s not a slam dunk. They all agree on one thing: It will take years and untold millions of dollars to litigate. If there are still legal battles being fought over this ten years from now, I won’t be surprised. Neither will I be surprised if there are a flurry of bills in the next legislative session to expand or abridge the rights of those who are suing. Get settled in for the long haul, we’ll be watching this for awhile. Can our dams handle the load? Pretty important question, wouldn’t you say? The state climatologist is warning that Texas dams will become less able to withstand extreme weather events like Hurricane Harvey, which are expected to occur more frequently as the earth’s atmosphere and oceans warm in coming years. Dams are designed with a wide margin of safety and are meant to withstand extreme, worst-case scenarios that are never expected to happen. But what stunned state climatologist John Nielsen-Gammon and other weather experts was that Harvey exceeded or matched the preposterous amounts of rainfall that dams in Texas are built to hold back. After Harvey, dam regulators will have to recalculate the maximum amount of water that dams should be capable of holding back, said Nielsen-Gammon. Climate change means that powerful storms are bringing vastly more rain than they did a century ago, he said. On the one hand, Harvey was an extremely unlikely event; by some estimates, a one in 500,000 year event. Nobody plans for that, and for good reason. On the other hand, if it could happen once it could happen again, and the consequences of a dam failure would be catastrophic. Even before Harvey, it was the case that the capacity of the Addicks and Barker reservoirs was declining due to the buildup of dirt and sediment over the years. Surely this is something that can be addressed. 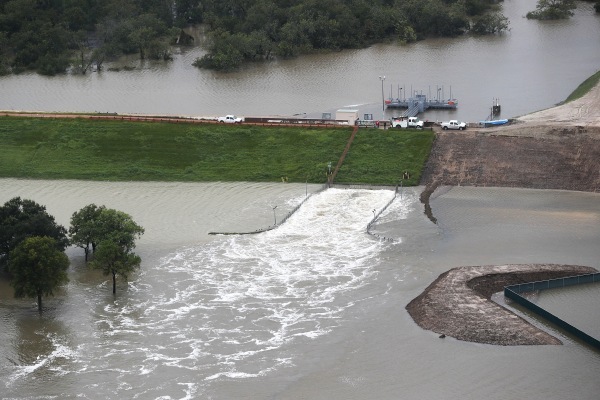 U.S. Rep. Sheila Jackson Lee, a Houston Democrat, is calling for the replacement of the aging Addicks and Barker dams that spilled over during Hurricane Harvey. Jackson Lee, a senior member of the House Homeland Security Committee, is pushing provisions in the Energy and Water Appropriations Act that would provide $3 million to fund the Army Corps of Engineers’ Houston Regional Watershed Assessment Flood Risk Management Feasibility study, as well as $100 million for flood control infrastructure. Another Corps document, this one from 2010, shows that the agency was using terms like “risk of catastrophic failure” for the dams for flood events much smaller than what Houston experienced during Harvey. That 2010 “interim reservoir control action plan” sets what it calls “maximum pool” levels for Addicks and Barker at elevations well under 100 feet, levels that could be expected during a 25-year storm — which has a 4 percent chance of occurring in any given year. Such a storm is about 30 times smaller than the rains generated by Harvey. The document, which also became part of the 2011 Sierra Club lawsuit against the Army Corps, doesn’t specify what the true risk of dam failure might be at such levels. It also doesn’t say what exact actions the Army Corps would take when water reached that point. Blackburn said the failure of the Army Corps to make the 2010 document public is just one example of the agency’s hesitance to address the risk of a dam breach. Matthew Zeve, the Harris County Flood Control District’s director of operations, said he had not seen the 2010 document before the Tribune sent him a copy. But he said he didn’t think the document expressed concern about the dams actually failing at such low water levels but rather indicated a “trigger” for when the agency should be continuously monitoring the dams and doing whatever it can to diminish risk. “It’s not, ‘Oh, we think it’s going to fail,’” he said, stressing that he was not speaking for the Corps but offering his personal interpretation of the document. Yeah, that’s not very reassuring. Let’s start investing in better flood mitigation infrastructure, shall we? A group of flooded-out Harris County homeowners and businesses sued the federal government on Tuesday, accusing the U.S. Army Corps of Engineers of knowingly condemning their properties by releasing water from the Barker and Addicks reservoirs after Hurricane Harvey. Bryant Banes, a civil attorney whose Heathwood home and his wife’s home business were deluged after the rains had subsided, is seeking compensation that could reach into the billions of dollars in what he hopes will become a massive class-action lawsuit that would include compensation for homeowners, building managers and business owners within the area flooded by the controlled releases. Justin Hodge, an expert in eminent domain at Johns Marrs Ellis & Hodge LLP, said such cases boil down to knowledge and intent — whether the government know what it was doing and intended to cause flooding that essentially amounted to “taking” of people’s properties. It’s not exactly a secret that the Corps did what they did knowing it would flood some houses that had not previously flooded. And as attorney Banes said, it’s not about right or wrong, it’s about paying for the damage done. I Am Not A Lawyer, but this seems like a pretty straightforward claim that has merit to it. We’ll see how it plays out, and in the end how much it costs. What is the environmental impact of building an Ike Dike? Maybe we should try to figure that out. 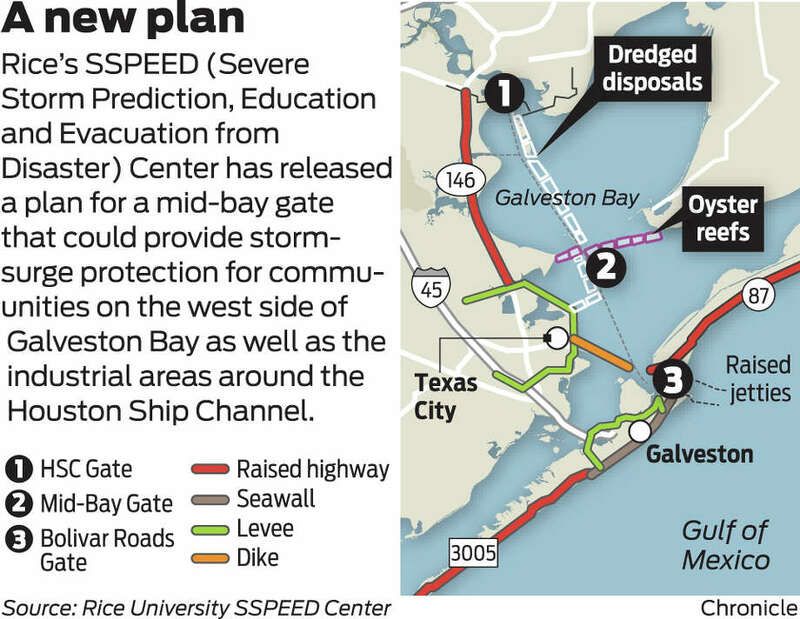 Plans for building a massive storm-surge protection system for the Houston area are rushing ahead before officials determine whether the project could harm Galveston Bay, environmental groups say. 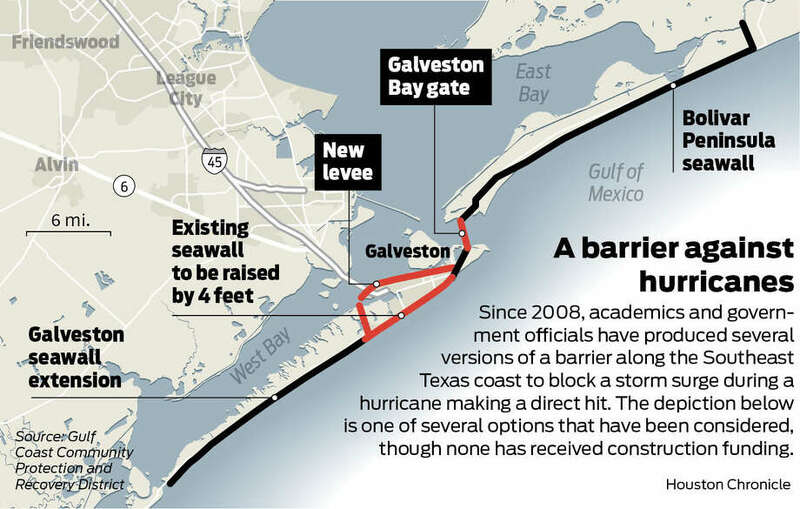 The Sierra Club and the Galveston Bay Foundation, the environmental groups most closely watching the planning process, worry that there’s been too much focus on how to build the so-called Ike Dike and not enough on its impact on the bay. The groups are concerned that political momentum for the existing proposal may be so strong by then that the study results will have little influence. “Maybe the Ike Dike is the best thing since Wonder Bread, but right now we don’t know because we haven’t looked at it,” Mannchen said. See here for previous Ike Dike blogging. I guess we need someone to create some models of the various proposals, to simulate what the effects of building them are, as well as the effect of having them or not having them in place when a big storm hits. It may be that even with some negative effects from the construction, the mitigation in the event of nightmare hurricane is more than enough to make it worthwhile. Or not. Who knows? It sure would be nice if we did. The title to this post is a bit of an overbid, but this is still a good thing. President Obama on Monday signed into law a bill that could help expedite the long process of constructing a hurricane protection system for the Texas coast, including the particularly vulnerable Houston region. The “Water Infrastructure Improvements for the Nation,” or WIIN, Act contains a major provision of another bill U.S. Sen. John Cornyn filed in April — the month after The Texas Tribune and ProPublica published an interactive report exploring the dire impacts of a monster storm hitting the nation’s fourth-largest city and its massive petrochemical complex. Scientists are still fine-tuning plans to protect against such an event, which they say could kill hundreds, if not thousands, of people and cripple the economy and environment. Most agree on the need to build a project known as the “coastal spine,” a massive floodgate and barrier system, but there is no official consensus plan. (State lawmakers have asked scientists to settle on a plan to protect the coast, but they’re still in disagreement.) The U.S. Army Corps of Engineers, which will have the final say on what plan to pursue and is conducting its own study of the issue, has estimated that construction on any such system for Texas couldn’t begin until 2024 at the earliest. The bill Cornyn filed in April, called the “Corps’ Obligation to Assist in Safeguarding Texas,” or COAST, Act, was designed to hurry things along by requiring the Corps to take local studies on the issue into account (one by a six-county coalition, in particular) and by eliminating the need for Congress to authorize construction of whatever project the Corps ends up recommending. See here for some background. We’re still a long way from something being built, as we lack such minor details as consensus on what to build and a funding mechanism for it. But this is a step forward, so credit to Sen. Cornyn for shepherding the bill through and to President Obama for signing it. The Current and Space City Weather have more. See here, here, and here for the background. Shortly thereafter, Cornyn’s bill had a House companion. Two days after U.S. Sen. John Cornyn filed legislation seeking to expedite a hurricane protection plan for Texas, U.S. Rep. Randy Weber said he expects to introduce a companion bill in the U.S. House in the coming weeks. “We’re heightening awareness, we’re trying to get this ratcheted up as quickly as we can, so that when appropriations do come into play, we can say, ‘OK, here’s the project we’ve been talking about, here’s why it’s important, and we’re just one step closer to getting funding for it,'” Weber said Friday in a phone interview. As you know, I have zero faith that Congress will pay for any of this. I think Cornyn will have a hard enough time just getting his bill to a vote in the Senate, and I have less faith that Weber can do the same in the dismal catastrophe that is the Republican-controlled House. Nonetheless, someone still has to file a bill like this, so kudos to Sen. Cornyn and Rep. Weber for taking the first step. They has their work cut out for them from here, and they are both a part of the reason why it’s basically impossible to get stuff like this done nowadays, but they did file their bills, so good on them for that. The Press has more. We can live without zoning. We’ve proved that. What we cannot live without, especially in a no-zoning environment, is sufficient regulation and administrative municipal clout to make sure commercial development is done in a way that doesn’t harm its neighbors. Politicians and bureaucrats excuse themselves for repeated flooding, blaming flat terrain, tropical rain and semi-permeable soil. This amounts to hiding behind Mother Nature’s skirts in a city with a tradition of overcoming natural challenges — digging a ship channel to the Gulf, putting a man on the moon, building the Astrodome and finding oil in impossible places. Commercial developers are able to summon the technical imagination and political will to get the water off their property. Why can’t the city — why can’t we — do more to keep developers from dumping their excess runoff into our homes? While homeowners spend their time making a living and raising families, the city’s developers, engineers, contractors and their hired minions lobby — and fund campaigns — to keep city development rules weak. We need a leading developer to recognize his or her enlightened self-interest in protecting neighborhoods that house the people who shop and work in developer-built malls and office buildings. There have been feints in the direction of improvement. Houston in recent years enacted rules that, to the casual reader, require developers to create detention basins to keep from flooding their neighbors. But there are loopholes that developer lawyers use to avoid doing so. They can cite previous development of a plot to get it “grandfathered,” exempting it from detention requirements. These loopholes offends common sense. If we really want to master our special Gulf Coast environment and topography, if we really want to have meaningful flood prevention, we should require detention under all commercial developments and redevelopments, even if the plot were previously paved over completely. Why is this essay more focused on detention than on bigger pipes and ditches, although we need them, too? It is because our bayou-based drainage system is overtaxed. The U.S. Corps of Engineers and Harris County Flood Control District say flow rates into Buffalo Bayou are maxed out. 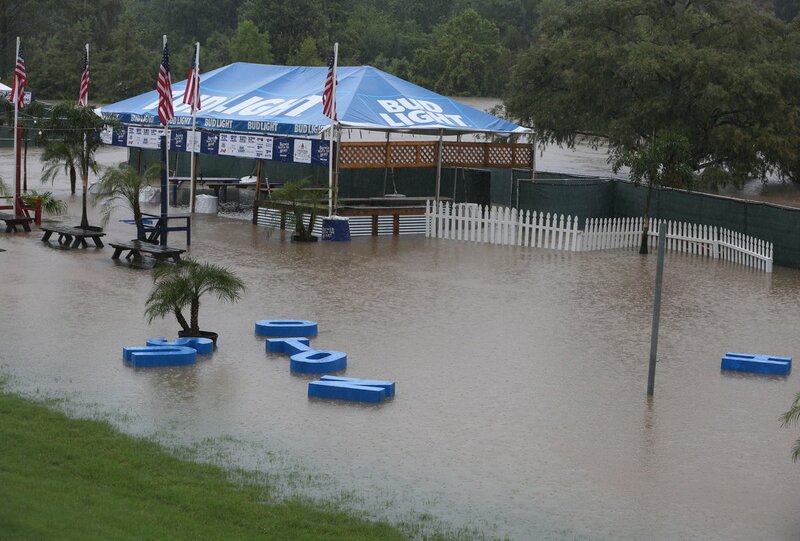 The bayou cannot accept runoff any faster than it already does. That doesn’t mean it can’t accept more water over time. It can. But detention is needed to slow the rate of discharge and allow more time for the bayou to drain. I don’t agree with everything said in these two articles, but I’m sure we can all agree that this is a problem and it needs to be addressed right away. What I would add to this discussion is that it’s not just a Houston problem. It’s very much also a Harris County problem, because an awful lot of formerly permeable grasslands and prairie have been paved over and developed into houses, shopping malls, parking lots, and our ever-expanding toll road network. What used to be absorbed is now runoff, and like everything else it flows downriver, which is to say in the direction of our fair city. We can enforce all of Houston’s ordinances to the letter, and we’re still going to have a problem thanks to the last 20 or 30 years of growth and development. What are we going to do about that? In case you didn’t have enough to worry about. Let’s hope it never comes to that, shall we? Now if you’ll excuse me, I need to go buy some sandbags. Houston’s Bayou Greenways 2020 initiative will build 150 miles of hike and bike trails along the city’s nine waterways, a $220 million effort that Mayor Annise Parker says is “one of the most exciting things I’ve had the opportunity to work on as mayor” – and which is only now gathering steam. The ambitious plan advanced Wednesday as City Council approved $19 million for the next phase of trails in north Houston and also cleared the way for the purchase of land on which some of the trails will run. Bayou Greenways’ construction progress has been modest thus far as the parks board designs the new trails and slogs through the dual permitting process of the Harris County Flood Control District and the U.S. Army Corps of Engineers, said the parks board’s Catherine Butsch, as both entities have jurisdiction. About 3.5 miles of trail have been built, mostly along White Oak Bayou, but Butsch said the pace is likely to increase sharply. Construction is to start soon along a section of White Oak in the I-10 corridor. That follows the recent openings of a new bridge near T.C. Jester and 11th Street over White Oak, and of a new trail section from Antoine to Alabonson. Along Brays Bayou, a trail section from Mason Park to Old Spanish Trail opened last year, and that segment will soon be extended to the University of Houston. On Sims Bayou, construction is scheduled to start on the two trail sections at the far eastern and western edges of the city limits by year’s end, in tandem with design work on the middle sections. Design also will start this year on two sections of trail along Greens Bayou and on a far western section of trail planned along Brays. I love this project, and I believe it will do a lot to make Houston a better place to live. We have all these bayous, we should be taking full advantage of them. A lot of the funding for this is privately raised as well, making it a better deal overall. I’m especially looking forward to the White Oak/I-10 work, but it’s great to see this happening farther out as well. Another one of our local disputes that has been picked up by national interests. One of the method’s foremost critics, G. Mathias Kondolf, a professor of environmental planning at the University of California at Berkeley, was with the group on the bayou. Natural Channel Design, which the Harris County Flood Control District has used since 2006, was created and popularized by Colorado-based hydrology consultant Dave Rosgen. Rosgen has little in the way of formal scientific training, but he recognized a demand for stream-restoration methods long before academics moved to meet it. Rosgen’s method, taught in short courses rather than Ph.D. programs, uses tree trunks and other natural materials to stop streams from eroding or changing course. The bayou’s surrounding urban environment, however, has sometimes made the channel’s dynamism difficult to accommodate. As flood-control district director Mike Talbott tells it, Buffalo Bayou is “coming unraveled.” The bayou has eroded and shifted course as Houston has boomed and development increased, and the proposed project would demonstrate a way to stabilize it. Notably, the last semi-natural stretch of Buffalo Bayou inside Loop 610 runs between Memorial Park and some of the city’s most visible and most expensive real estate, creating a dividing line between public land and private property. The flood control district and conservationists agree that this marriage of public and private space has not been a happy one. Some of the landowners whose properties border the bayou have responded to the bayou’s natural erosion with ecologically and hydrologically problematic solutions – things like removing vegetation and replacing it with vast concrete walls. The flood-control district can’t control what those landowners do. But by addressing an area slightly downstream from these expansive backyards and their bad solutions, the district intends to showcase a better way, Talbott said, one that would stabilize the bayou and reduce erosion without being so ecologically destructive. 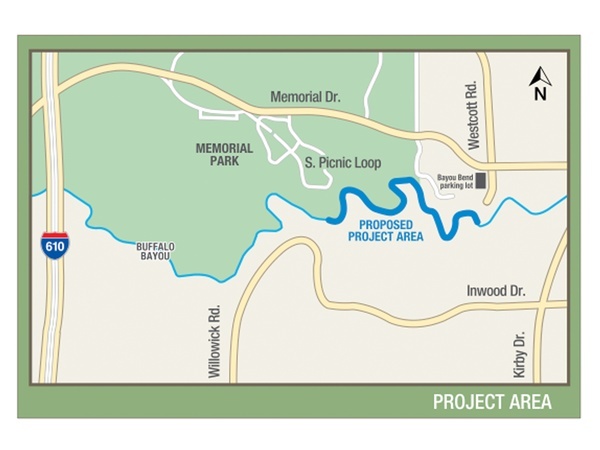 The Memorial Park Demonstration Project, which would cost an estimated $6 million, has both money and broad institutional support, with funding lined up from the flood-control district, the city of Houston and the River Oaks Country Club. The Memorial Park Conservancy and the Bayou Preservation Association are also backing it. But the project is not a done deal. Even if the Army Corps of Engineers approves the flood-control district’s proposal – there is no specific deadline for them to do so – it will have to go through another public hearing process, as required by the Texas Parks and Wildlife code. See here for the background, and here for the case against the Rosgen approach, as articulated by Save Buffalo Bayou. Prof. Kondolf was here in November to inspect this part of the bayou and give a report on it; you can read a brief summary of that here and see a video of his presentation here. Save Buffalo Bayou is a good resource if you want to know more about this part of the bayou that most of us never get to see. It seems likely to me that the Memorial Park Demonstration Project will go forward as planned, given the support for it, but we should at least understand what the alternative is. Harris County, despite a history of costly floods, appears likely to scale back its flood control work in the coming years in the face of declining federal funding. In a typical year, the county gets about $30 million in flood control work from the Army Corps of Engineers, Harris County Flood Control District director Mike Talbott said. This year, the county appears likely to receive no more than $3 million. The Corps’ Galveston District, which includes Harris County, spent $56 million on flood control during the last federal fiscal year. This year, without stimulus dollars or Hurricane Ike recovery money, the district has $9 million. Harris County Commissioners Court members, reluctant to raise taxes to cover the gap created by federal cuts, say they would rather shift spending away from other items to fund flood control. That, however, may prove difficult, given the 10-percent budget cut the county enacted earlier this year. There is another answer, actually. Since the gap in Harris County’s funding comes from a loss of federal appropriations, you could urge Congress to take action on this important issue. The need for flood control projects isn’t going to go away just because the funding isn’t there. With negative real yields on Treasury bonds, it will never be a better time for the federal government to make these kinds of infrastructure investments, and it might put a few people back to work, too. And if your Congressperson refuses to hear any of this, you can take the next step and support someone else for the office. Not that Steve Radack will do any of this, of course. You can be sure that he’ll be prepared to blame someone else the next time there is a flood that could have been mitigated, however. That’s always cheap and easy to do. The Sierra Club has filed a lawsuit to block construction of the Grand Parkway in west Harris County until federal and state officials conduct a new analysis of the flooding consequences. The environmental group says the 15-mile toll road may increase runoff into Addicks dam, which the Army Corps of Engineers has identified as among the nation’s riskiest because of the potential harm to low-lying Houston should the 1940s-era structure give way. The lawsuit, filed in U.S. District Court in Houston, comes seven weeks after the Army Corps issued the final permit for the new leg of the long-planned outer beltway around greater Houston. 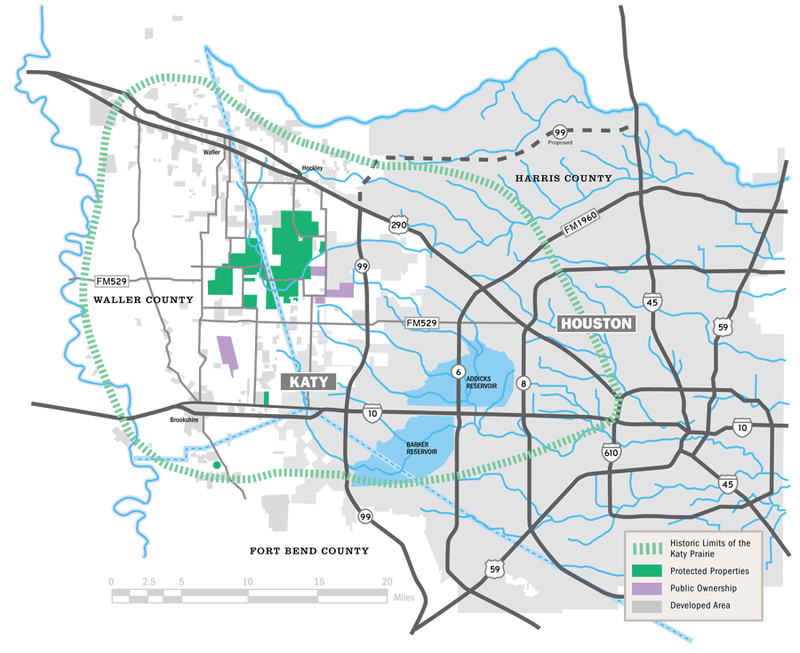 The toll road would cut through the Katy Prairie between U.S. 290 and Interstate 10 – a mostly undeveloped area that stores rainwater like a natural sponge. I believe the Grand Parkway is a bad idea and a misuse of resources, and I have no doubt it will have a negative effect on the environment. I don’t know nearly enough about the specific claims here to offer any judgment. Anybody out there want to comment on this? Swamplot has more. Bummer. Remember the plan Harris County Commissioner Steve Radack floated to allow bowhunting of feral hogs in George Bush Park, both as pest control and boon for the local food banks? The Army Corps of Engineers, which had say-so on this matter since the park was federally created as a flood control measure, put the kibosh on it. In a March 19 letter, Richard Long, the supervisory natural resource manager for the Corps’ Houston office, agreed that the park’s feral hog population is a major problem for the Corps, the county, park users and nearby homeowners. But he said a limited archery program probably is not the appropriate solution. For one thing, he said, a hog that is wounded but not killed could become a serious threat to the hunters, other park users or the people who live near the park. And allowing certain people to hunt would give the appearance of preferential treatment while potentially leading some people to mistakenly believe the entire park is open for public hunting. “This would create a major enforcement problem for all agencies concerned as well as have a detrimental impact on the wildlife resources of the project,” Long wrote. Long suggested expanding the trapping program Radack has been operating for more than a decade, which currently removes about 300 to 400 hogs every year. Ah, well, it was fun while it lasted. On the plus side, this should reduce the chances of Ted Nugent showing up unannounced for some weekend recreation. So perhaps expanding the trapping program is the best way to go.